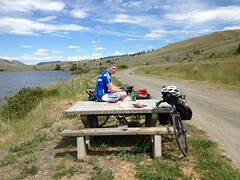 Day 2 | Kamloops to Merritt | captain-nicholls | Le Tour de U.S.
Woke around 7:30 and Francois was already awake. We went to Denny's for breakfast and I had a wonderful lumberjack breakfast. Francois had an unusually small breakfast. Back to the motel and packed up to go. As we were leaving the room a lady and ( I presume) her daughter, in another room, asked us if we needed or wanted any food. They had come up from Colorado to pick up their son/brother as he had got a concussion whilst on a cycling trip. We thanked them for the offer but we have no room for extra food. As we left the hotel we started a 475m climb that took us to highway 5a. It was a very hot morning and we took a short break at the top and took some photo's. We knew we facing a headwind today and that hit us pretty much right away at the 15 km mark. We stopped at 35 km and again at 75 km for breaks. I tweaked my knee a bit today but right now it feels great. Great as in, I sprained it 5 days ago and I'm on a massive bike trip, great. At one point on the ride we were inundated with grasshoppers. For about 1 kms they were everywhere on the road. Dead ones squished under tires and a lot of live small hoppers bouncing everywhere. Kind of creepy. The ride today took us by two very nice lakes one of which I believe is call the Nicola lake. We are staying at a little crappy motel called Sportsman Motel in Merritt. Total cost for the night $73.85 tax in. Last night was a bit more at $98.00. We are splitting the rooms evenly but once more guys come on board Francois will have to create his algorithm out for that. He's good at it and I don't have to worry about it. Jamie sent me a picture of herself with a new haircut. Was nice to see her face. We are thinking about dinner now. So we went for dinner at Subway which is much cheaper than restaurants. We also went to DQ for ice cream after. I rode there as my knee is feeling ok and I did not want to take any chances. I asked the guy at Subway if I could fill a bag with ice as our motel does not have an ice machine. I proceeded to spill ice, root beer and another beverage all around the dispenser as I tried to fill a zip lock bag with ice. Harder than you would think. On another note, the weather looks questionable tomorrow so we are thinking that if it rains we are going to rest here rather than Vancouver. We'll have to wait and see. 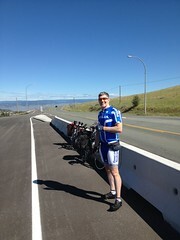 Top of 5a out of Kamloops after nearly 500m of climbing.